The League of Women Voters® is organized at the National, State, and Local levels. Each League can have its own specific positions on issues, such that all Leagues respect the National positions and all Local Leagues respect their State’s positions. Positions are arrived at by consensus of the membership, after study and discussion. The 2016-2018 publication of LWV US’s positions is “Impact on Issues”. LWVNM may adopt and use new positions after consensus is achieved and once they are formally accepted by the Board. In odd-numbered years, LWVNM Convention delegates formally vote to adopt the new, updated, and continuing positions or to drop or modify them. The League of Women Voters of New Mexico believes that potential impacts on sustainability should be considered in formulating new positions and in advocating using current positions. Sustainability is defined as meeting the needs of the current generation without impairing the ability of future generations to meet their own needs. Judges of the higher courts should be appointed by the governor from a screened list submitted from a non-partisan nominating commission and be subject, at intervals, to election for retention or rejection. The League believes that the justice system must be adequately funded in order to carry out its goals. Funding of specialized programs for offenders, including behavioral health (i.e. mental health and substance abuse treatment), is essential. The League supports sufficient funding to guarantee humane prison conditions and to provide programs and services that offer the opportunity for self-improvement. The League believes that state funding should be provided for alternatives to incarceration. There must be adequate personnel for all courts. The League supports the expansion of prevention and treatment programs to ease the burden on the criminal justice system. The League supports the concept of pretrial diversion. The League supports development of alternatives to incarceration through community-based programs with emphasis on diversion and reintegration into the community. These programs should be separate from correctional facilities. The League supports alternative or therapeutic courts and pre-trial diversion programs. The community must be educated regarding these alternatives. The League opposes mandatory minimum sentences for drug offenses. In general, alternatives to imprisonment should be explored and utilized, taking into consideration the circumstances and nature of the crime. The League supports an adequately funded government-supported public defender program that provides legal aid to those unable to pay. The League of Women Voters of New Mexico supports the repeal of the death penalty and the institution of a sentence of life in prison without parole as an alternative. allowing opponents of the death penalty to serve on the jury for the first trial (to determine guilt or innocence) in a capital case. education for all youth in the juvenile justice system. 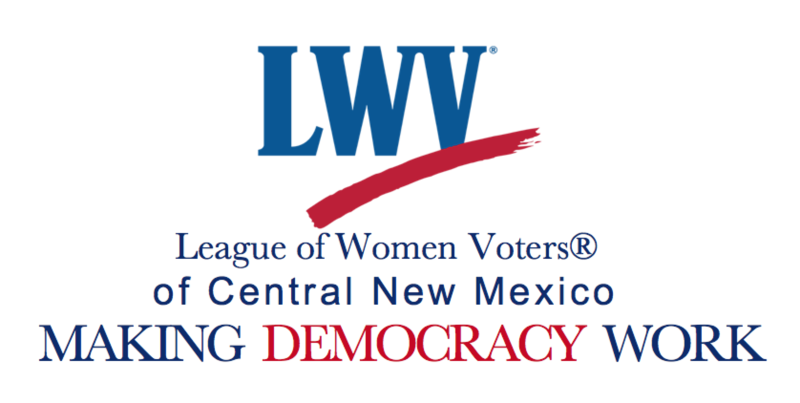 LWVNM supports a redistricting process and standards that provide the people with a meaningful choice in electing their representatives and facilitate holding government accountable. not intentionally favor any political party. The League supports having an independent commission or other independent group develop redistricting plans meeting these criteria. The public must have access to all information used in the redistricting process on a timely basis and have the opportunity to comment and be heard on the proposed redistricting processes, criteria, and results. The League of Women Voters of New Mexico believes that methods of financing political campaigns and public offices should ensure the public’s right to know, combat corruption and undue influence, maximize fiscal accountability and transparency, and allow maximum citizen participation in the political process. The League of Women Voters of New Mexico supports legislative compensation that is fair and reasonable, recognizing that there is a cost to government and that the cost should be paid by the taxpayers of New Mexico. The League of Women Voters of New Mexico supports a fair, equitable and reasonable combination of public/private funding of campaigns for New Mexico state elective offices. Participation in the public/private financing should be voluntary. Participants should agree to voluntary spending limits. The legislation should provide for a source of revenue to fund the program. The League of Women Voters of New Mexico supports limits on gifts and contributions to candidates for elected offices and to the holders of elected and appointed offices. The League of Women Voters of New Mexico supports firm and consistent enforcement of campaign finance, gift and contribution reporting laws with significant penalties for non-compliance and wide public dissemination of reports. An independent office or commission should have the authority to oversee campaign finance and gift laws as well as other ethics rules and lobbying laws, to receive allegations and complaints, to conduct investigations and to present cases to the appropriate enforcement agencies. The League of Women Voters of New Mexico supports a New Mexico Constitution which is concise and comprehensible, providing a basic framework adaptable to present and future needs of state government. LWVNM supports a less restrictive amending process in the Constitution. systems that improve the election experience and provide ease of ballot access including vote-by-mail, supplemented by secure ballot drop boxes and accessible voting centers. The League of Women Voters of New Mexico supports four-year terms for state executive officers, preferably elected in non-presidential years with limitation of two consecutive terms in the same office. LWVNM supports a shortened ballot. The League of Women Voters of New Mexico supports home rule for municipalities. The League of Women Voters of New Mexico supports a combined form of city/county government. PRC candidates should be evaluated on the basis of qualifications by a broad-based nonpartisan process. Candidates for the PRC should have education and/or appropriate professional experience in a related field or in consumer advocacy. There should also be mandated, ongoing professional training after election. The PRC should be funded by assessments on the industries that it regulates and those funds should be sequestered from the general fund. The legislature should approve a budget sufficient to enable the PRC to carry out its allotted duties successfully. Insurance and Utilities should be regulated by separate agencies. The laws forbidding ex parte communications between Commissioners and those who are interested parties in cases before the PRC should be very strong, and penalties for violating these laws also should be strengthened. The PRC should have an inspector general charged with reviewing practices for handling incoming payments properly, conducting internal audits of other functions, and pursuing such other investigations as are deemed necessary. The PRC Commissioners and advisory staff should be prohibited from working in a business regulated by the PRC for at least 1 year after they complete their tenure at the PRC. Consumer interests should have strong representation when the PRC is making policy decisions and setting rates. adequate to finance the essentials of government. The tax system in New Mexico should be progressive. LWVNM may support taxes that are regressive if it is determined that the tax will achieve a socially desirable objective. In evaluating the average burden of taxation within the state, taxes should be compared with income of New Mexico residents; in comparing the burden of taxation in New Mexico with the burden imposed by other states, state and local taxes should be combined. Tax credits and/or deductions should be evaluated based on promotion of equity and the efficiency with which they achieve their purpose. Tax credits may be a means of providing relief from the regressive nature of the sales and property tax. The League believes it is the state’s obligation to collect revenues to fund services that are generally state responsibilities, rather than depend on cities and counties to raise the funds. The League of Women Voters of New Mexico supports a merit system of selection, retention, promotion and dismissal of personnel in state government. The League of Women Voters of New Mexico opposes term limits for our state legislators. The League of Women Voters of New Mexico (LWVNM) expects all state and local governments, executive and legislative, to follow the requirements of the New Mexico Open Meetings Act (OMA) and Inspection of Public Records Act (IPRA). Broadcast as many public meetings as possible, in both real-time and an archived format, preferably on-line. Hold meetings in executive session only when absolutely necessary, even though the OMA may allow otherwise. Include an explanation of the purpose of the executive session in the meeting agenda. Keep a public record of all attendees at executive sessions and make that information public when the public body reconvenes after executive session. On important matters of wide public interest that have been discussed in executive session, publish a draft motion based on what was discussed in executive session and allow public input on it at a public meeting before a vote is taken. Create an inspection of public records policy and procedure whose goal is to help the public obtain the maximum amount of information they may want to discover about their government and do so in a timely and cost-effective manner. Use the government website as a repository for searchable budget and financial records, including operating budgets, expenditures over a specified amount, checks/warrants and any other budget and financial information made available to the governing body. These data should be in a non-proprietary format that maximizes the public’s ability to download and analyze data. State and local governments’ resolutions, ordinances, or published policies should cover ethics and conflict of interest, providing sanctions for violations. Managers responsible for transparency should be trained and evaluated according to relevant statutes, policies, resolutions and ordinances. Elected officials should receive training on statutes and other mandates applicable to them. State and local governments should encourage input and listen to their constituents. They should make it easy for constituents to comment on local issues, and as budgets allow they should periodically assess the needs, desires, and satisfaction of their constituents. They should respond to constituents’ recommendations by changing policies and practices or providing explanations when they reject such input. State and local governments should provide timely and complete information to their constituents on current topics. State and local governments should provide up-to-date, easy-to-find information about their office locations, building directories, organization charts, and contact information for managers of key functions. The League of Women Voters of New Mexico believes that government should promote and ensure responsible stewardship of our natural, human, and cultural resources, particularly in the face of growth and development. The League supports the conservation and protection of wildlife and their habitats for the contribution they make toward the health and sustainability of the environment. An essential prerequisite for protecting our resources is to require comprehensive analysis of the environmental and fiscal impacts of applications before issuing a development permit. The League believes that government must conduct its programs, policies, and activities in a manner that promotes equity and affords fair treatment, accessibility, and protection for all residents, regardless of race, age, culture, income, or geographic location. The League finds that the responsible management of our land is critically important to ensure the long-term health and well-being of all New Mexicans, to protect the resilience of our urban and rural communities, and to preserve habitats and natural landscapes for the continued viability of all species. The League further notes that land use is inextricably linked with other important issues such as water, energy, food, transportation, air quality, and climate change. Strategic planning at the local, regional, and state levels must not consider land use in isolation. Government subsidies for development should only be approved when the benefit to society justifies the full cost and outweighs any detriment to the natural environment. preserve open space and natural habitat for wildlife by identifying and regulating areas of critical concern including fragile areas, wildlife corridors, historic areas, riparian habitats, and natural hazard lands. Transparency and public participation in decision-making must be part of the process at all levels of government. A substantial portion of the land in New Mexico is controlled by the State Land Office (SLO). The LWVNM believes that the SLO should practice transparency and accountability in its actions and should include local communities in decision-making. The State Legislature should ensure that the State Land Commissioner has the support needed to maximize profits and minimize administrative costs, while protecting the environment and preserving the long-term value of the land. improve public access to alternative forms of transportation such as cycling and walking. The League calls for government agencies responsible for transportation planning to reach out to the general public to improve public participation in transportation-related decisions. All future road projects should take into account the needs of all people. LWVNM recognizes the vital contribution that New Mexico farmers and ranchers make to our health and welfare by supplying us with food and promoting a vibrant economy for the state. LWVNM urges the state to work with the industry to promote research and education about more sustainable agricultural practices. As stewards of our natural and human resources, we must preserve healthy local ecosystems for future generations. provide more funding for the Cooperative Extension Service for the support of local agriculture. The League supports programs that protect clean air. Effective air pollution controls should be implemented for both stationary and mobile sources of emissions. The New Mexico Environment Department is the chief regulatory agency responsible for air quality protection in the state. It is important that the public has access to the regulation development process and that the subsequent permitting and enforcement ensure that air quality is protected from deterioration. Permitting and enforcement must be performed in a transparent manner. ensure that the full cost of remediation is borne by those who cause the pollution. The scientific evidence is clear that our climate is changing and that human activities resulting in the emission of CO 2 and other greenhouse gases are significant factors in the heating of the planet. The League supports policies and incentives that reduce greenhouse gas emissions by promoting greater energy efficiency; by developing clean, renewable energy sources; and by encouraging further research on alternatives to the combustion of fossil fuels for energy. Industries in New Mexico should be required to pursue carbon reduction strategies. The League also believes that government should educate the public about how to reduce individual carbon footprints and should offer incentives to do so. adequate bonding or other financial guarantees for mining and drilling activities to fund clean-up operations in the event of abandonment by companies. The League supports stringent regulations to protect ground and surface water quality from pollution that can impact human health as well as the natural flora and fauna. Such regulations must be strictly enforced. preserve and restore rivers and watersheds. Conservation of water and efficiency of use must be encouraged to enable New Mexico to meet its interstate compact obligations, to help balance use with supply, to relieve stress on the physical system, and to reduce net depletion. identify critical and emerging issues. Local land use plans should be required to be consistent with applicable regional water plans. The public welfare statements of a regional water plan should be considered by the State Engineer when reviewing applications for transfer of water rights. Compliance with water availability determinations by the Office of the State Engineer (OSE) under the Subdivision Act should be mandatory. Review of subdivision applications pursuant to the Subdivision Act should be expanded to encompass all divisions of land. Long-term cumulative impacts as well as short-term water requirements of development should be taken into consideration by the local permitting authority. The applicant must be required to acquire water rights before development can proceed. The impact of any transfer of water rights on the area of origin must be assessed. The permitting authority should evaluate the impact of proposed developments on “public welfare” as defined by the applicable regional water plan and be able to demonstrate that the proposed development is consistent with the plan. New residential and commercial developments should be water-efficient. Growth should not be permitted where water is not available. Local zoning and subdivision statutes should be updated. State and local governments should collaborate in addressing the problem of antiquated subdivisions in order to facilitate planning and to make the water budget process meaningful. Maintenance of in-stream flow and general ecological health must be recognized as a “beneficial use” of water. The OSE must be given more authority to regulate domestic well permits. Improved regulation and monitoring of domestic wells and septic systems is essential to protect groundwater supplies and should be adequately funded. The effort to gather data must be coordinated and adequately funded by the state, which should establish consistent protocols, accounting methods, and terminology. The state should also help implement the regional water plans and provide coordination among planning activities at the different levels of government and across river basins. health of the state’s rivers and watersheds. Governments at every level must educate citizens by developing and disseminating data about water resources. Local governments must promulgate and enforce regulations promoting conservation, including positive incentives and rate structures. The League of Women Voters of New Mexico supports current and future efforts to increase the availability of safe, decent, and affordable housing for moderate and low income households through the following actions. Increase housing options for households in New Mexico, including but not limited to seniors, the disabled, and first-time homebuyers. Promote a variety of housing styles and types for rent and for purchase that are integrated within communities. Support strategies including public and private partnerships and grants, developmental agreements, rehabilitation, fee waivers, density bonuses, and an affordable housing trust fund and land bank. Support policies that link transportation, land use, and affordable housing. Programs to meet the before and after school needs of school-age children. The League of Women Voters of New Mexico believes that our state has no resource of greater importance than its children. Programs, personnel and facilities that promote and encourage the child’s fullest development must be a high priority within the private sector as well as in city, county and state governments. The League of Women Voters of New Mexico believes that social, economic and legal concerns must be interconnected for the fair and equitable treatment of all children. The League of Women Voters supports a continuum of services that is available to all children and their families. The programs in the continuum should include, but not be limited to: prevention , intervention, family support, education, enhancement of physical, emotional, and social well- being; substitute care; and juvenile justice programs. The programs and associated services in the continuum should be community-based wherever feasible. Carefully supervised crisis shelter care that would separate neglected and abused children from juvenile offenders. Family crisis and domestic relations intervention. capitalizing on what is already here, such as existing businesses, technologies, and people (e.g. creativity). providing centralized expertise for specialized areas such as technology commercialization, international trade, intellectual property, and regulatory approvals. The League of Women Voters of New Mexico (LWVNM) believes that education is the cornerstone for perpetuating a strong and viable democracy. The public education system should impart to all students an understanding of the nature of democracy and the responsibilities of citizenship, the ability to think critically, and the skills necessary to continue to learn and function as adults in a complex society. The League supports public schools as the primary method of educating students. The League opposes the presence of private, for-profit companies in the governance, management, and provision of public education. LWVNM believes that a regionally elected State Board of Education should be responsible for appointing a Superintendent of Public Instruction and directing education policy, regulation, and finances. Use the Common Core State Standards to provide a framework for knowledge and the academic skills that students are expected to master, with flexibility for district and charter schools to determine how the standards are taught and measured. Develop to each student’s highest potential the knowledge and skills needed for success in adult life, along with a broad understanding and appreciation of history and prospects for the future. Cultivate each student’s capacity to solve problems and make decisions. Provide opportunities for all students to develop their aesthetic awareness and creative abilities. Foster an awareness of the rights, privileges, and responsibilities of participation in a democratic society. Foster an understanding of basic economic principles and the need to manage resources for the benefit of both present and future generations. Provide the tools to make wise college and career choices and to understand the importance of each individual’s work in the local, national, and world economies. Promote practices that lead to physical, mental, and emotional well-being. Enhance the sense of community within the school, as a microcosm of the larger society, through standards of conduct that reflect a concern for the opinions, values, aspirations, and well-being of all. Develop the critical thinking and problem-solving skills of students through experiential learning and through the use of technology. Maintain and use health and social service teams in the schools to identify and work with at-risk students and their parents or caregivers, with referrals to appropriate community agencies when necessary. Collaborate with all sectors of the community to improve public education at all levels. Seek business initiatives offering work schedules that support student attendance at school. Create incentives to encourage students to develop career skills and graduate from high school. Implement programs that increase involvement of parents of all socioeconomic groups in the education of their children at all grade levels. Secure collaboration among a broad base of community organizations, social service agencies, and schools to enhance the development of children from birth to age five to prepare them for success in kindergarten and beyond. Focus student evaluation on student academic progress rather than rigid standards of proficiency. Use student testing to assist teachers in providing effective and timely strategies for student academic achievement. Implement measures to improve the preparation, recruitment, professional development, and retention of quality educators with in-depth knowledge in core academic subjects and instructional strategies. Follow due process procedures when terminating teachers and principals who do not meet minimum standards. Base assessment of school and teacher performance on overall quality of the education provided to the students and improvements in student academic growth as measured by multiple methods, including professional observations. Use a distribution formula that reflects differences in student needs, teacher experience and qualifications, the number of schools and students in a district, level of education, capital outlay, and transportation requirements. Programs that foster children’s language development, from birth to age 5, for success in kindergarten and beyond should be adequately funded. The New Mexico State Equalization Guarantee funding formula should be used to achieve equity and to provide fair funding for every child based on need, regardless of location. There should be periodic review and modifications to assure that the formula is faithful to its original intention. Funding should provide for high quality education for all students and be consistently and fairly applied across the state. Local school districts should control the funds distributed to them by the state. All state and federal mandates should be accompanied by funding so as not to place an undue burden on the public schools. The League of Women Voters of New Mexico believes that every student should have access to a high quality, publicly funded education regardless of race, ethnicity, family income, or geographical location. The League believes in accountability, transparency, and equity in the use of public funds for education. Charter schools are discretionary programs intended to fill unmet needs and/or to test innovative instructional strategies to produce quality educational outcomes. Policy makers must ensure that adequate funds are available for traditional public schools and define how charter schools fill unmet needs. Appropriate instructional and support services must be provided in all public schools to meet the diverse needs of individual students. there is a demonstrated need based on student population projections. New Mexico should provide flexibility and supplemental funding for magnet programs and career academies within traditional public schools. Charter school innovations demonstrated to be effective should be disseminated to improve the traditional public education system. The state should establish a closure policy revoking the contract of a charter school that fails to meet minimum academic, financial, and organizational standards for two consecutive years or for two of the three most recent years. A charter school’s finances should be available for public scrutiny, and budget processes should be similar to those for school districts, which require the public to be provided with an opportunity for input into decision-making. Charter school governing council members should adhere to standards and best practices as delineated by the NM School Boards Association. Funding to state-chartered schools should minimize the amount allocated to for-profit management and business operations with oversight provided by state-approved auditors. Funding should be equitable so as not to advantage charter schools over traditional public schools. NM should develop an effective performance-based accountability system for charter schools focused on increased proficiency, academic growth, and college/career readiness standards to ensure that charter schools demonstrate positive student outcomes. Charter schools that do not meet the established benchmarks should be put on time-limited improvement plans and not allowed to increase enrollment until they have met the benchmarks. LWVNM believes that public funding for virtual schools should be less per student since the schools do not require brick and mortar facilities. Financial education measures that increase the ability of consumers to successfully use small dollar loan financial products. The League of Women Voters of New Mexico supports a health care system that provides a comprehensive level of health care for New Mexico residents and recognizes the need for efficient management of health care costs. Quality health coverage for all New Mexicans: Every New Mexican should have full health care coverage, a benefit package that is at least equal to the best plan offered to state employees, and access to the services covered. Participation should be mandatory. Pre-existing conditions should not be excluded from coverage. “Seamless” coverage and continuity of care, to the extent possible, regardless of changes in life circumstances such as change in employment, marital status, financial status, or health status. Effective cost management: Cost management should increase the health care benefits that accrue to patients from any given level of spending. Improvement of health care quality and safety: A comprehensive effort to improve the quality and safety of health care in New Mexico should be launched and sustained, with dramatically increased public funding. Equitable funding: Reform should seek to reduce or eliminate cost-shifting across categories of insurance programs and payers, both public and private, and to make the distribution of financial burdens more equitable. believes such legislation should provide safeguards against abuse for the dying and/or medical personnel. LWVNM believes that alleviating poverty is the shared responsibility of government, employers, individuals, and non-profit assistance organizations. All sectors should be involved in setting an adequate minimum wage or living wage. The living wage is the minimum required to avoid poverty without government assistance and subsidies. The living wage (gross income) should cover the costs of food, clothing, housing, energy, transportation, health care, K-12 education, child-care, taxes (income, Social Security), and supplemental expenses for work and school. The LWVNM supports the passage by the state legislature of a minimum wage law tied to the cost of living and also supports the passage of minimum wage ordinances by local governments, if they perceive a need. The League of Women Voters of New Mexico (LWVNM) expects state and local governments to support an adequately funded mental health care system that provides comprehensive services to the acutely, chronically and seriously mentally ill of all ages; maintains optimal mental health services for all clients; places emphasis on meeting the needs of children; offers mental health services for the homeless; seeks additional funds for preventive services; implements a master plan to integrate services; raises awareness of critical unmet needs; and emphasizes case management. maintain optimum mental health services for all clients. Model mandatory outpatient care programs with adequate supervisory staff. The League of Women Voters of New Mexico believes that a free and open Internet is increasingly important to the protection of individual liberties – freedom of speech, freedom of the press, and freedom of association – guaranteed by the U.S. Constitution. LWVNM also believes that net neutrality protections are essential for political discourse, dissemination of news, and democratic participation. Therefore, LWVNM supports protecting the open, neutral, nondiscriminatory nature of the Internet. High-speed affordable Internet access is an essential service that should be readily available to all New Mexico residents and businesses. State and local government policies should support affordable broadband, wireless, and other means of high-speed Internet deployment throughout the state and should encourage consumer choice in broadband providers. Furthermore, LWVNM supports making high-speed Internet access available to all New Mexico residents, without charge, through schools, libraries, and other secure public buildings. Efficient, high-speed access to the Internet for all New Mexico residents – regardless of geographic location or neighborhood demographics – is a necessity for assuring equal access to local and state government, for maintaining openness and transparency in government activities, for communicating with legislative leaders, for engaging in political discourse, for competing in the global marketplace, and for assuring that voters receive the information they need to participate in our democracy. LWVNM believes that community access television and radio channels — for public, educational, and governmental programming — must be adequately protected, promoted, and funded for New Mexico residents. Community access media should be available on basic service tiers and over the Internet. Government should provide opportunities for citizen participation in decisions regarding community access media. Access to the public airwaves is essential to the public interest and to the League of Women Voters’ mission and purpose: to protect civil liberties, to ensure open, transparent government, and to promote the public’s right to know. adequate funding for enforcement, rehabilitation and education programs. These programs should be prudently and appropriately funded. The League of Women Voters of New Mexico believes that alcohol abuse is a public health issue and can be most effectively approached as such. raising taxes on the sale of alcohol. Research has shown increasing taxes is the single most effective way to reduce death, harm, and costs associated with alcohol abuse. dedicating all funds raised by increasing taxes on alcohol to treatment and prevention programs. No taxes on alcohol should be distributed to the New Mexico General fund. enacting laws making consumption of alcohol by minors illegal except under the supervision of their parents. increasing parental responsibility by means of education and social responsibility laws.